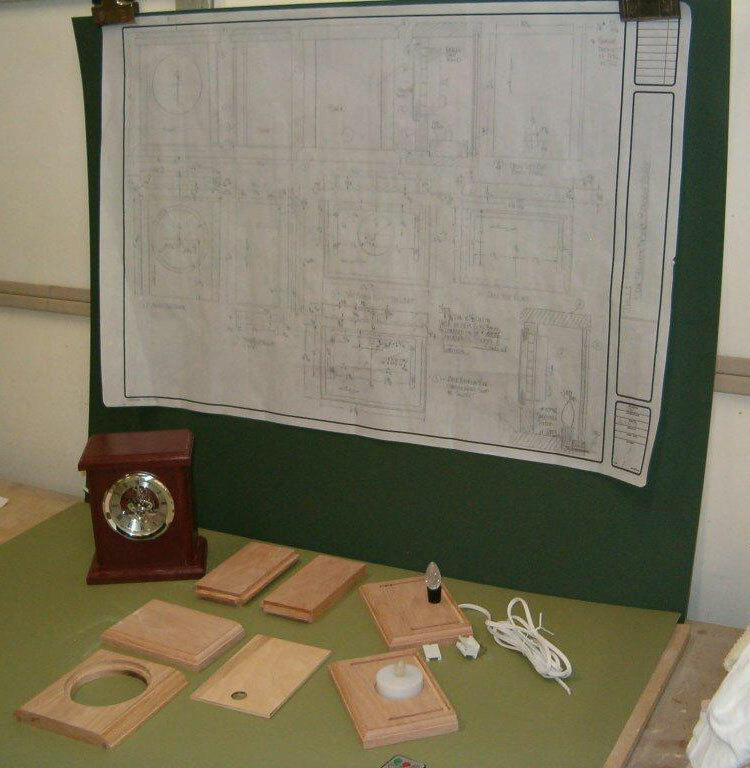 You may be wondering, “What’s the inspiration behind new Klockit woodworking plans?” The answer: our plan product ideas come from many sources, but perhaps the most frequent plan inspiration comes about as a result of a new component – clock motor, clock insert, weather-related instrument, etc. – being introduced as a potential new product. While these new components are often very innovative and interesting, it is not always obvious how our Klockit customers could use the components. This was recently the case when a skeleton movement insert was introduced to our new product group. Everyone agreed this item would be of great interest to Klockit customers, but there was some concern about how to best accentuate the skeleton configuration of the movement insert with its moving gears. What if the skeleton movement insert could be backlit within the case using an LED tea light or candelabra light? We knew that if we could develop a woodworking plan for a small backlit clock case, our customers could not only enjoy building our the design, but they would then incorporate our backlit feature into many other clock case designs of their own creation. After evaluation of a preliminary clock design model, I set about drawing detailed construction drawings from which to make the formal model to be used online and in the Klockit catalog. Next I actually constructed each part (shown in the photo) to the drawing specifications to ensure complete accuracy of the drawings that would be made into scaleable CAD plans. Last I assembled and finished the wood parts into a formal photography model using a cranberry-colored finish. This particular woodworking plan product is going to be a great 2-3 day project for our Klockit woodworkers. Be looking for the introduction of this great plan later in 2014. This plan will let you build the perfect gift(s) for family and friends! HELP…seems to be no way to enter the site. Hi Rachel, which site are you trying to enter?